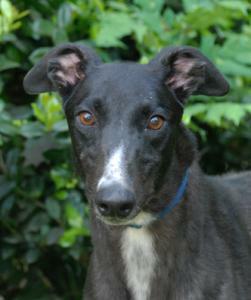 Blackjack is a sweet, friendly, happy boy that will celebrate his 4th birthday on March 19th. He raced at 75lbs. Blackjack passed his cat and small dog test so should be fine living with either. He has been living with a small white dog in foster care with no problem. He is home acclimated and has great house manners already. Blackjack has a glossy black coat and is SO beautiful. We need to get some newer photos of him because the ones we have are from when he first arrived and didn't have a shiny coat and was a little too thin still. Blackjack is quiet in his crate and potties well on leash and was actually fostered for awhile in a townhouse so would be a great apartment dog. He gets along well with other dogs but seems like he would also be fine as an only dog. He isn't that interested in playing with toys but has a ball he likes. He will roll over, show his belly and wave his paws at you to get a belly rub. Blackjack's only negative is that he has been a little grouchy about his space occasionally when laying down. Just a growl, never a bite. It isn't something that happens often and has improved and only happened once in the last 4 or 5 months. We think he probably should be placed only with older children that will understand not to bother him when he is asleep or laying down though.